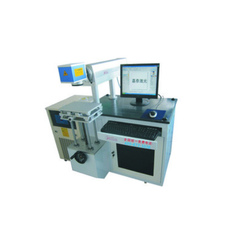 Our product range includes a wide range of hologram cutting and numbering machine. Our this Laser machine is the most advance technology in this industry at present, it working with extraordinary performance on speed and accuracy, Our this machine is able to content those industres where require roll to to roll cutting or roll to roll numbering or who have huge quantity work on laser cutting .Our this model is super successful and in huge demand specially in Hologram industry ,continous paper cutting ,Mobile screen card cutting . We use World class superior-grade raw material to Fabricate this Machine,an incredibly strong, rigid chassis, all the key compononents we use of MADE IN GERMANY AND US.A . You simply won't find more feature-filled systems than those in Our Roll to Roll Cutting and Marking Laser series. Each feature has been designed with you in mind, and how you can get the most from the laser. You'll find features that improve connection capabilities, simplify project setup, and much more.